Audemars Piguet began in 1875 when Jules Audemars, then 23, and Edward-August Piguet, 21, met in the Valle de Jous looking for jobs in the local watchmaking industry. 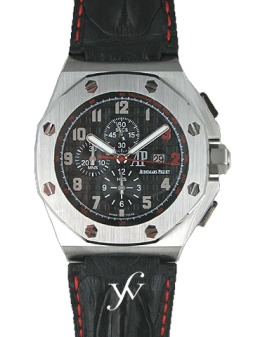 Audemars was the watchmaker in charge of production, and Piguet took charge of sales and marketing. Successful from the beginning, the Audemars Piguet trademark was registered in 1882, and the firm was officially founded later in 1889. Today, Audemars Piguet is the oldest Manufacture still owned and operated by its founding families. In 1972, the company made the daring choice to launch the world's first high-end sports watches in steel: the Royal Oak. Audemars Piguet's history is marked with many landmark records and world firsts-- the first wristwatch with tourbillon and mechanical winding, the smallest self-winding watch with perpetual calendar, the Dual Time, the Ladies Minute Repeater Chiming watch, to name a few.